Living in the mountains of West Virginia I’ve always wanted to go out west and hunt. Hunt the open country with no trees and the big mountains far from civilization. A few years ago I started looking at different states that I would like to hunt. What I found was very confusing, preference points, bonus points, unit, draws and land owner tags. And even more confusing, every state was different. One day while in the internet, I came across a website called The Huntin’ Fool. “Wow, this is just what I need, someone to help me.” The first year I built points in just a couple of states. Then to me, applying was half the fun. I started building points in more states and for more species, looking at a long term plan. After a couple of years I had built enough points to draw an elk tag in a good unit in a few different states. I decided in 2009 I was going to book a hunt. I filled out the guided hunt finder in Huntin’ Fool and mailed it in. a few days late, I received a phone call, it was Huntin’ Fool staff member Jeff Warren. Jeff was very helpful in recommending quite a few outfitters for me to check out. A few weeks later after checking out all the outfitters Jeff had recommended I called Jeff back. “Jeff, do you have anymore?” I asked. “They’re just not what I’m looking for.” “I don’t want to hunt on an ATV or from a four wheel drive, stay in a lodge or see any civilization. I want to go hunting. Jeff said, “then call this guy, he’ll take you hunting.” That being, Justin Mitchell of Action Adventures in Montrose, Colorado. 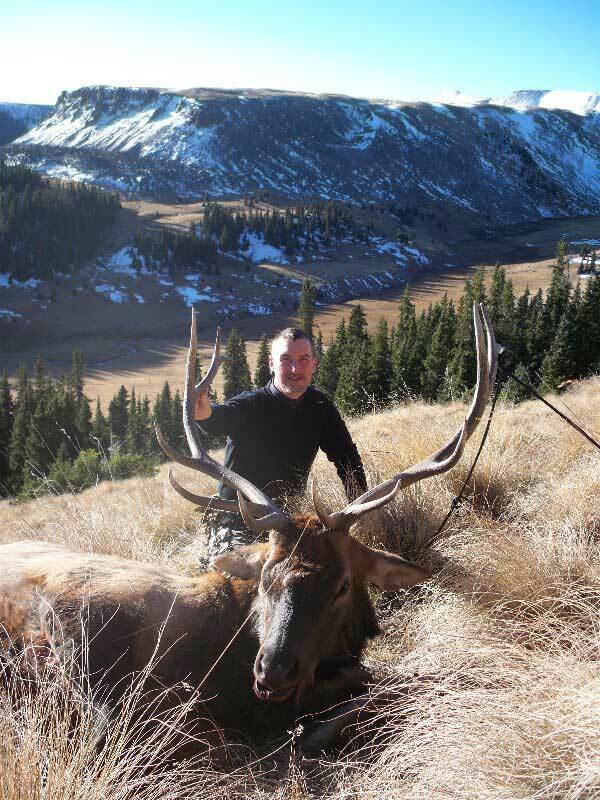 Justin specializes in wilderness areas for big bull elk. After calling and talking to Justin I booked the hunt. Come October, I’ll be on my way to Colorado, second rifle season wilderness hunt. When October came, I arrived in Colorado ready to hunt. The day before the season, we drove thirty miles on a dirt road to meet Justin at the trail head to ride horses another thirteen miles to camp. We were definitely away from civilization. The scenery was absolutely beautiful. Justin was not only my outfitter, he was also going to be my guide. The first day of the hunt we saw plenty of elk. Just too far away to get to. All in all it was a great day of hunting. The second day of the hunt started by riding horses two hours in the dark. He tied the horses up waiting for it to get daylight. When it go daylight, Justin had us right in the large herd of elk. At least six to seven big bulls were in the herd bugling back and forth. There were elk everywhere. They were getting ready to go over the top of the mountain. We had to run to get into position for a shot. I was glad I had gotten in shape for this hunt. You could see the bulls in among the cows. Justin said, “there’s the one you want.” A few minutes later we were standing over a nice six by six Colorado bull elk. What a hunt. There was definitely lots of actions and adventure, from the time we left the trail head till we returned to the trail head. On the place ride home I was thinking how fortunate I was to have the Huntin’ Fool help me build my points and recommend the best units. And also for Jeff Warren to recommend such a great outfitter. If you’re new to hunting out west like I was, read the magazine, have them apply you for and call them for an outfitter when you get some points. Good huntin’.